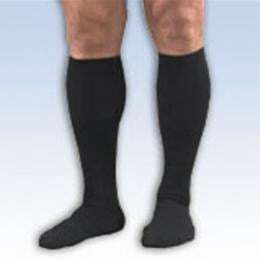 Graduated compression socks help prevent and relieve leg fatigue and heaviness, ankle and foot swelling, mild spider veins and varicose veins by improving circulation in the legs. Stylish with their ribbed appearance, these medical support socks give comfortable, preventative support while still remaining fashionable. Wide, turned welt top holds sock in place without digging into the skin. Comfortable balloon toe. One pair. Colors: Black, Navy, White, Tan, and Brown (H25 only).